DroneViewer | View your drone video in a whole new way! View your drone video in a whole new way! Watch your drone videos in a whole new way! New: Now works with GPS-enabled GoPro HERO cameras! With DroneViewer you can play your videos on the main screen while watching your drone’s speed, distance, position, and bearing update on graphs, data displays, and maps. You can geotag key points in your route and jump back to them instantly. You can export portions of your videos to separate clips, or export just a single geotagged frame. You can save your route to common file formats such as comma-separated value (CSV), GPS-exchange (GPX), or Google Earth (KML), for further data analysis. Here is a short movie demonstrating some of DroneViewer’s extensive capabilities. Play your drone or GoPro HERO videos on the main screen while watching your drone’s speed, distance, position, and bearing update on graphs, data displays, and maps. “Geotag” points of interest along your journey. Export these to a file. Or import them back in. Zoom in/out and pan your video while it’s playing. And much more! Check out our Users Manual for more details. Download the FREE version below. The free version is fully functional but has a 1-movie load limit. Purchasing either DroneViewer or DroneViewer Pro removes the limit and the initial splash screen. After upgrading you will receive a registration code within 24 hours. 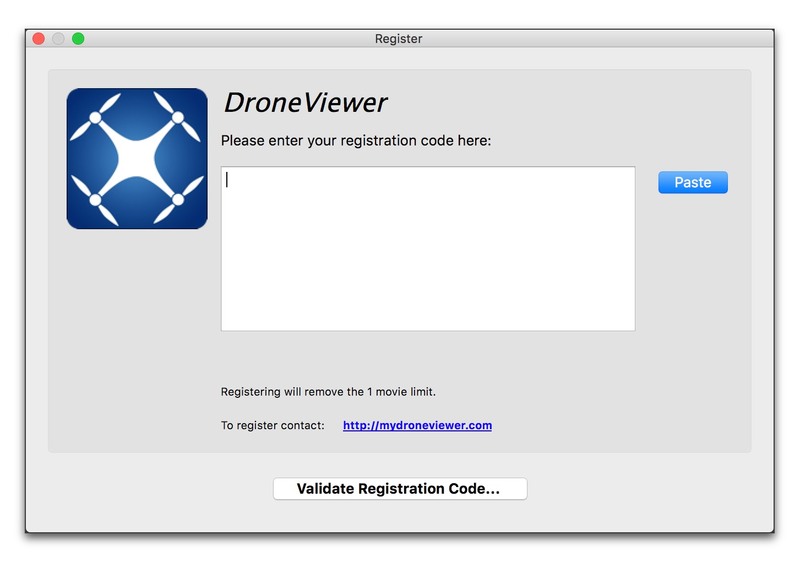 The code is entered directly into the DroneViewer program through the Register window located under the Help menu. This will remove the startup screen and eliminate 1-movie load movie restriction. A tutorial showing how to register is provided in the Videos section. 2For drones that support these metrics. Please try the free version before purchase to make sure it works for you and your drone. The Mac version of DroneViewer runs on Mac OS X 10.10 and above. 1600×1200 or higher resolution recommended. DroneViewer is not a “signed” application. If macOS issues a warning when you try to run it, see the installation instructions for how to install. Windows 10 is recommended but DroneViewer may run on earlier OS’s (Windows 7 and 8). Please see the installation instructions. 1600×1200 or higher resolution recommended. Low-end Windows PCs with poor video performance and limited screen resolution are not recommended. DroneViewer comes with a Users Manual, which includes detailed descriptions and window screenshots. You can preview it here: DroneViewer Users Manual. This software uses code of FFmpeg licensed under the LGPLv2.1 and its source can be downloaded here. The GPL version is recommended for high-quality movie exporting. See the DroneViewer Users Manual for how to install the GPL version into DroneViewer. Does it work with the Mavic air? No, the Mavic Air doesn’t store navigation info in its SRT file. Please see FAQ. The answer is “maybe”. I don’t have any video or SRT samples from an Inspire2. If you could provide samples I could probably make it work. Just remember to turn Video Caption on in the Go app before your flight. Does it support M2 Zoom? I haven’t tested the M2 Zoom. But the MP2 Pro does not store GPS data in the SRT file, like the MP Pro did. So I’m guessing the Zoom doesn’t either. However, if you have an M2 Zoom SRT file you can send me I can verify this. Should work with Matrice 200 series then. I know the M210RTK and M210 store the data. Not sure about the M200 though. Question – .MOV files only or can .MP4 also be used. MOV and MP4 are supported. Ah,, I see my answer when reading the manual. Good to point out that when one renames their video that they have to also rename the .SRT files as well. Yes, good point. The movie filename (minus the extension) and the SRT filename (without extension) should be the same or else DroneViewer will not know they are paired. I have loaded a video from the P4Pro v2 which has the embedded .srt. I all works although the track line is very course in a series of steps. Any solutions please? Jim, the coarseness is due to the lat/lon data precision of the waypoints embedded into the video file. It would be great if DJI increased the precision even by one decimal point. I’ve brought this up to them in their forums but it’s fallen on deaf ears. Any chance you could email me an SRT file so I can examine it?